Woldumar Nature Center is a non-profit environmental education resource in the lansing, Michigan area. The Nature Center offers the most diverse ecosystems in the region with 150 acres and five miles of trails of woodlands, prairie, river-side and pine forest along the Grand River shoreline. Trails are open to the public all year from dawn to dusk. Woldumar is a destination for schools throughout the state where teachers can choose from a variety of nature programs for their students. Numerous outreach and on-site Environmental Education programs for children as well as adults. Visit the website to learn about all the annual events, Camp Discovery, the popular summer day nature camp and details on private and public rentals. Woldumar is a self-funded 501(c)3 non-profit environmental education center that does not receive state or federal funds. A new Visitor Center is planned for the near future and many new programs and facilities are desired as well as increases in staff and operation. The current financial resources need to be increased to meet these goals. Much of the marketing pieces were done in house by staff and lacked a consistent and identifiable look to the public. These pieces also needed to reach very different audiences: students, parents, corporate and private sponsors. 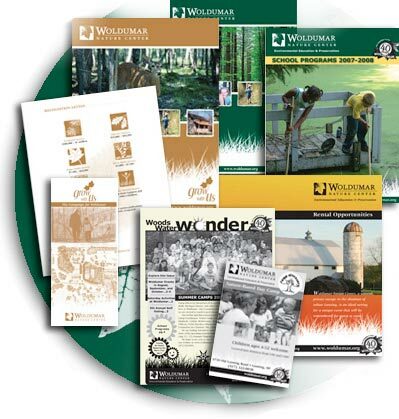 The Woldumar brand needed enhancement and a focused annual campaign was needed. Brand Design: The Woldumar Nature Center brand captures the wonder and fun in nature and the value of environmental education. The images and presentation connect with children and adults alike. The materials emote a feeling of stewardship for all committed to support our environment for now and the future. Woldumar Logo: The leaf image speaks of Woldumar in all seasons – strong, calm, nourishing beautiful and resilient. The use of green ink connects the brand with the environment and signifies the growth of nature and all who celebrate earth’s bounty. Typography is casual with a classic style reminiscent of hand lettered wooden alphabets with clean, crisp serifs legible from a distance. Our design resulted in a more professional presence in the community and an increase in school program registrations. Woldumar is using the materials to position themselves with schools throughout the state and increase donors and memberships. Oh my gosh, oh my gosh, these are amazing and beautiful! Sherrie and I were about in tears when we looked at your designs for the campaign a bit ago. You have completely captured the vision for the campaign’s essence through your design. Thank you so much, Connie. You have so much talent.